Emjoying reading Vin Scully recollection of the Dodgers-Giants rivalry. I can’t wait to head to Dodger Stadium but it just started to rain in Los Angeles! We have not had rain in FOREVER! 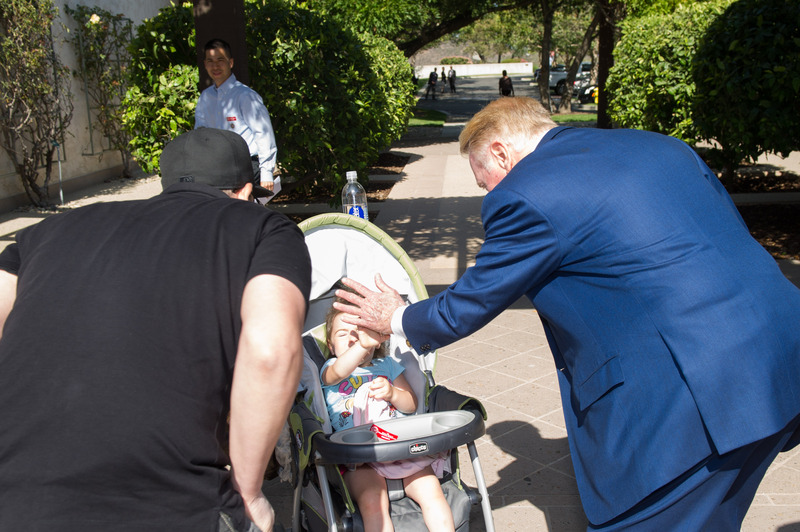 This morning, Vin Scully spoke on a conference call with the national media. 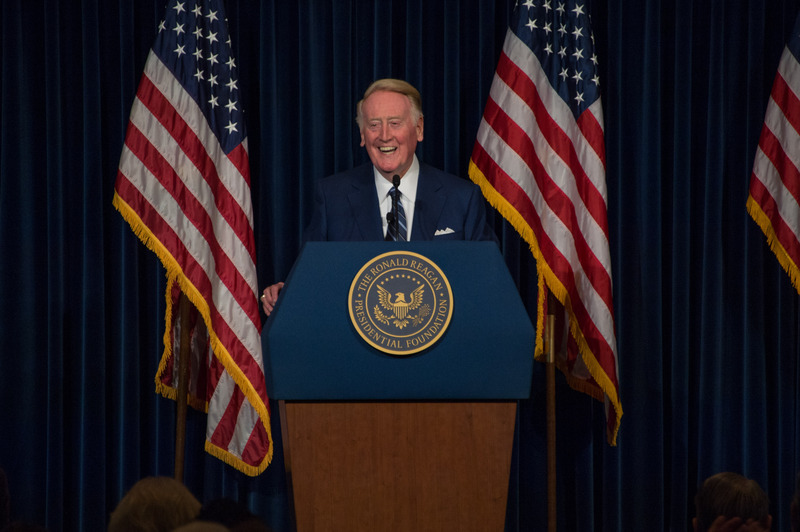 Given the series beginning tonight at Dodger Stadium and the fact that he will call his final game October 2 in San Francisco, several questions circled around the Dodgers-Giants rivalry. With Russ, when I was back in New York, I can actually remember one night in his kitchen harmonizing with Russ and Ernie Harwell, one of the beautiful memories in my entire life. Vote for me for Dodger Fan of the year by going to Twitter and using the hashtag #DODGERSFOTY4. Thank you! I am a long time Dodger season ticket holder. My first recollection of hearing Vin Scully was in my boyfriend’s Datsun truck. I remember that Summer. I was the first Dodger and Baseball fan in the family and I have converted many since then. In 2013, I was awarded the Hilda award from the Baseball Reliquary given in memory of long time Brooklyn Dodger fan Hilda Chester. The award is given to recognize distinguished service to the game by a baseball fan. I am also an active member of SABR (Society for American Baseball Research) Go Dodgers!! You can now vote for the Dodgers’ Fan of the Year in an MLB contest sponsored by Esurance. Laura Zimmerman: Zimmerman is passionate about all things Dodgers, as she attends every home game and follows the club’s Minor League affiliates. Vincente Reyes: Reyes dedicates his Instagram to sharing the dazzling photos he personally captures at Dodgers games in various locales. Danny Del Toro: Elvis tribute artist Del Toro has combined his love of the King and the Dodgers, and he is now renowned as Dodger Elvis. Emma X Amaya: Season-ticket holder Amaya is a savvy fan who rarely goes a day without posting about the Dodgers on her Facebook page. 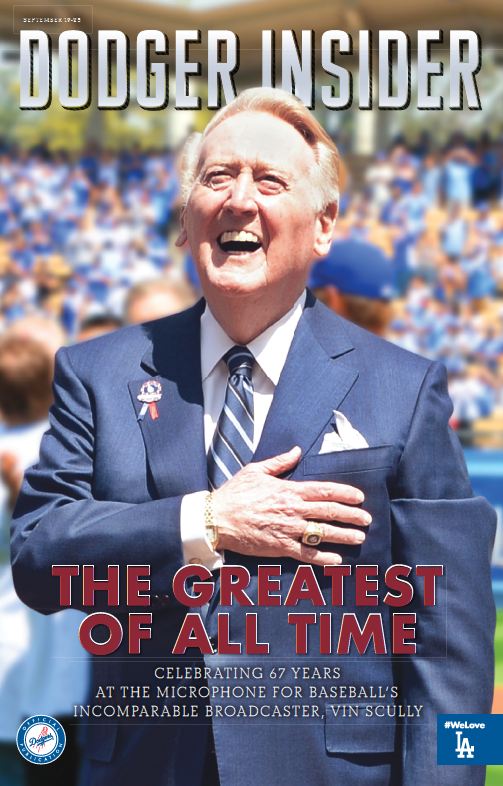 Looking forward to getting these two Dodger magazines with Vin Scully on the cover. They are small and free. That last weekend at Dodger Stadium is going to be very emotional. Get your kleenex ready.